1 of 1 Unwrap and chop 12 Andes mints (about 1/3 cup) and fold into batter. To frost: Combine 1 stick (1/2 cup) softened unsalted butter with 2 cups confectioners sugar, 2 tbsp milk, 1/2 tsp peppermint extract and 2 drops green food coloring in a bowl. Beat on medium speed until smooth. 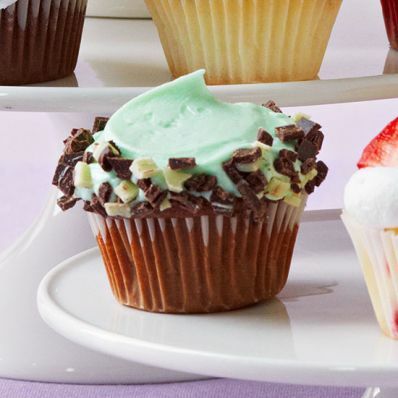 Spread over cupcakes and roll edges in 16 unwrapped and finely chopped Andes mints.